Our founders and earliest members knew the impact of protest and the power of direct action. “Do something besides worry” was an early mantra. And it’s one thing that’s always set Breast Cancer Action apart. We’re taking to the streets again—because our lives are on the line. Will you join us on September 8 and/or September 13? 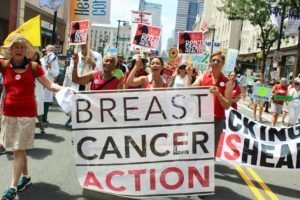 We’re calling on California’s Governor Jerry Brown to put an end to fracking and dangerous drilling that threatens to increase our risk of breast cancer—and causes other health harms. Fracking and dangerous drilling are more than climate change issues—they’re an urgent public health threat. The U.S. is now in a position to rival Russia as the top oil producing country, thanks to the rapid growth of fossil fuel production. These toxic practices contaminate our air and water with chemicals known and suspected to increase the risk of breast and other cancers. We’re paying the price with our health and our lives. 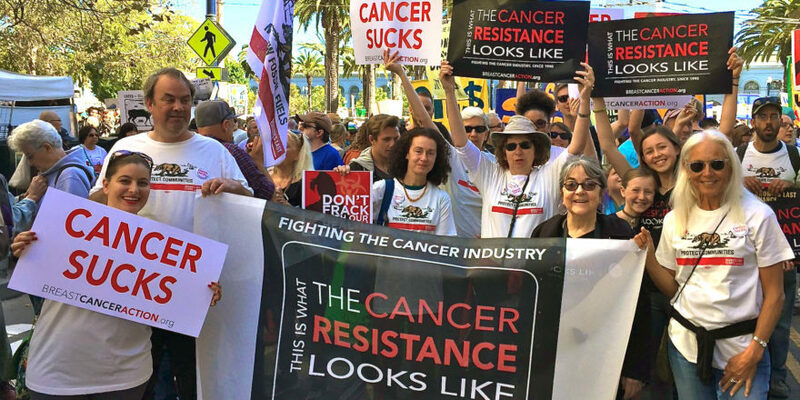 Over the years, you’ve joined our webinars on fracking and other forms of dangerous drilling, attended our health forums, read our op-eds, marched with us, and taken action. You know fossil fuels are fueling cancer. But Governor Brown refuses to take action. So we’re taking to the streets. *Need a ride to San Francisco? Click here to find a bus near you heading to the march. **Not in the Bay Area? Join us in solidarity at a RISE march near you. We have a critical opportunity right now, when the world’s eyes are on San Francisco for the Global Climate Action Summit. We and our Brown’s Last Chance partners are spearheading two major actions demanding Gov. Brown stop poisoning people and the planet. In his final months of office, he’s focused on securing his legacy, but if he doesn’t do the right thing the only mark he’ll leave on history will be a giant oil stain. We’ll have t-shirts, signs, and other materials for you at both actions! ← Food for Thought 2018 – Don’t miss out!